A protester throws an object during the first ever gay pride event in the Montenegrin seaside resort of Budva, Wednesday, July 24, 2013. Dozens of extremists shouting "Kill the gays" attacked gay activists as they were gathering for the event in staunchly conservative Montenegro. The assailants threw rocks, bottles and various other objects at some 20 gay activists and supporters and at special police securing the event in the coastal town of Budva on Wednesday. BUDVA, Montenegro — Several hundred people shouting “Kill the gays” attacked gay activists and clashed with police on Wednesday in a bid to disrupt the first ever pride event in staunchly conservative Montenegro, which is seeking to improve its human rights record as it bids to join the European Union. A protester throws an object during the first ever gay pride event in the Montenegrin seaside resort of Budva, Wednesday, July 24, 2013. Dozens of extremists shouting “Kill the gays” threw rocks, bottles and various other objects at gay activists as they were gathering for the event. Police then intervened to push the attackers away and allow the event to continue. The participants briefly marched by the sea before they stopped to hold speeches as extremists shouted insults from a distance. Later, police again clashed with smaller groups of opponents scattered throughout the town, while the gay activists left the town by boat f or security reasons. 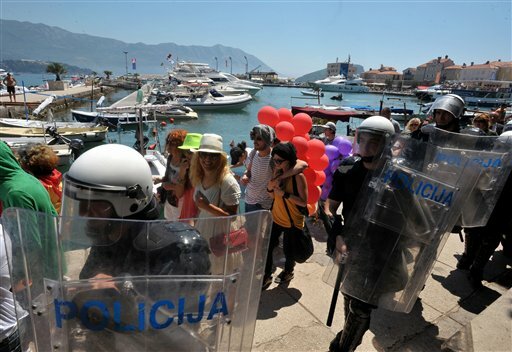 Montenegro gay activists, flanked by police, march during the first ever pride event in the Montenegrin seaside resort of Budva. Montenegro police officers arrest an anti-gay protestor during the first ever gay pride event in Budva, Montenega. Protesters shout “kill the gays” during the first ever pride event in the Montenegrin seaside resort of Budva on Wednesday. Interior Minister Rasko Konjevic praised the police, saying they prevented more serious clashes. Konjevic said several people have been injured, none seriously. Police said about 20 people have been detained. An AP reporter at the scene saw several injured people and witnessed police detain several attackers. “Unfortunately, in 20 years of transition Montenegro has not matured enough to tolerate differences,” said Aleksandar Zekovic, one of the organizers of the rally. Montenegro, a country of some 600,000 people, is known for its macho male culture and respect of traditional values. Some newspapers published mock obituaries for prominent gay activists ahead of Wednesday’s rally, while cafes in Budva – the country’s key tourist re sort – stopped playing music for an hour on Tuesday in protest. “I don’t approve of violence, but I didn’t know how to explain this gathering to my son,” said Bosko Lukic, a Montenegrin vacationing in Budva. Previous attempts to organize pride events in the country failed over threats of violence. In 2012, actors who posed as a gay couple in a video promoting tolerance were badly beaten in the capital, Podgorica. But Montenegro’s pro-EU government has expressed support for the pride event and urged tolerance. Elsewhere in the region, gay pride events were held this year without problems in the EU’s newest member, Croatia, and one is planned in Serbia this fall. Dozens of people were injured in clashes during a 2010 pride march in Serbia, prompting the authorities to ban similar gatherings fo r the past two years. Serbia’s gay groups hailed the holding of the pride event in Montenegro as “strategically important” for the promotion of gay rights in the country. 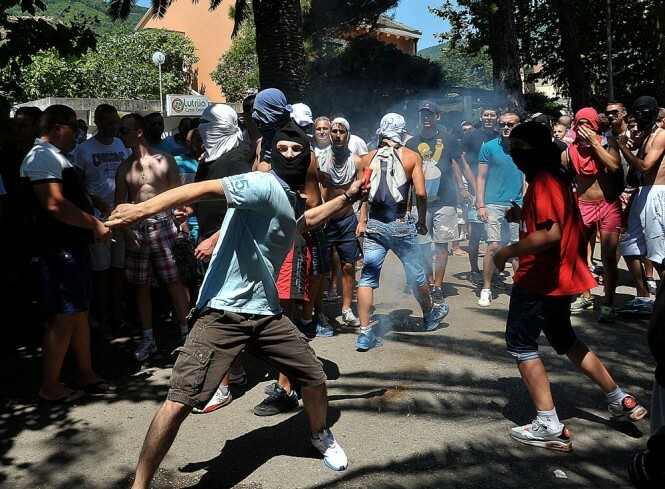 The violence shows that the government must do more to promote tolerance in Montenegro, they added in a statement.